Looking for market research tools that can help you doing survey research? Wondering about sample size? Margin of error? Which survey tool is best for your business? Our research tools can help you! We have developed tools to make your life as a researcher easier. If you have been searching for the right survey tool for your organization, or are trying to estimate the sample size and margin of error for a survey, these tools can be handy and save you a lot of time and effort. If you are looking for a survey tool, you have come to the right place. We can help you choose one. No need to spending time searching for tools on the Internet and taking demos. We have done it for you. Check individual tools or compare them side by side. We have currently evaluated nearly 20 online survey tools. The list of survey tools and features is constantly updated. 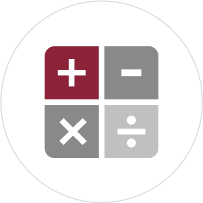 Use our free and easy to use calculators to estimate how big of a sample you need for a test or survey or what the margin of error is for a particular sample size.